The GUI dialog does not provide any options for specifying a different import location. 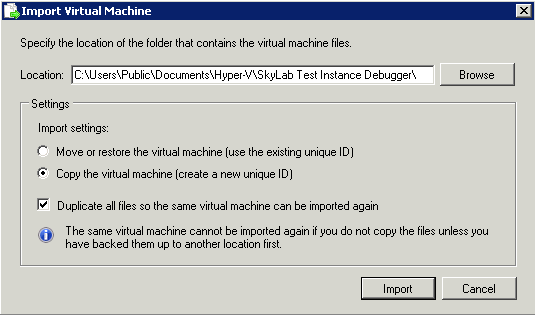 If you import a virtual machine through that GUI, Hyper-V will attempt to import the VHD file into its base directory (usually \Users\Public\Public Documents\Hyper-V\Virtual hard disks). This behavior leads to the file collision mentioned above. Looking for another alternative, I stumbled upon the PowerShell Management Library for Hyper-V (PsHyperV), a cool and rich PowerShell scripting library for Hyper-V.
PsHyperV provides the Import-VM commandlet, which allows you to import a virtual machine programmatically via PowerShell. Unfortunately, it only provides the same amount of paramters as the GUI version and thus fails to import a second instance of the same virtual machine, since it does not allow you to specify a location to which the VM should be imported to. However, the source code of the commandlet was a good starting point for learning about WMI management classes for Hyper-V.
$exportDir = "C:\Exports\InstantLab Test Instance Debugger"
$managementService = Get-WmiObject -Namespace "root\virtualization" -Class "Msvm_VirtualSystemManagementService"
echo "Creating debugger instance $i"
echo "  Making import directory: $importDir"
echo "  Updating import settings"
$importSettings.Name = "InstantLab Debugger $i"
Test-WMIJob $result.Job -wait -StatusOnly -Description "  Importing VM"